This is the onboard camera footage taken at the event. 1909 was an historic year in aviation when French aviator Louis Bleriot made the first crossing of the English Channel in a heavier than air aircraft and Blackpool launched the worlds first official air show. The first “official” aviation meeting to be held in the United Kingdom, was staged at Blackpool, in 1909. A rival event was being held at Doncaster on 15th-23rd October but the Blackpool event had the “official” backing of the Royal Aero Club. Since those early days Blackpool Air show has been at the forefront of family entertainment air shows, with exciting flying programs designed to appeal to all the family. The stunning Blackpool sands and iconic Tower make a unique backdrop to one of the north west’s finest air shows. The primary action takes place between North Pier and Central Pier. 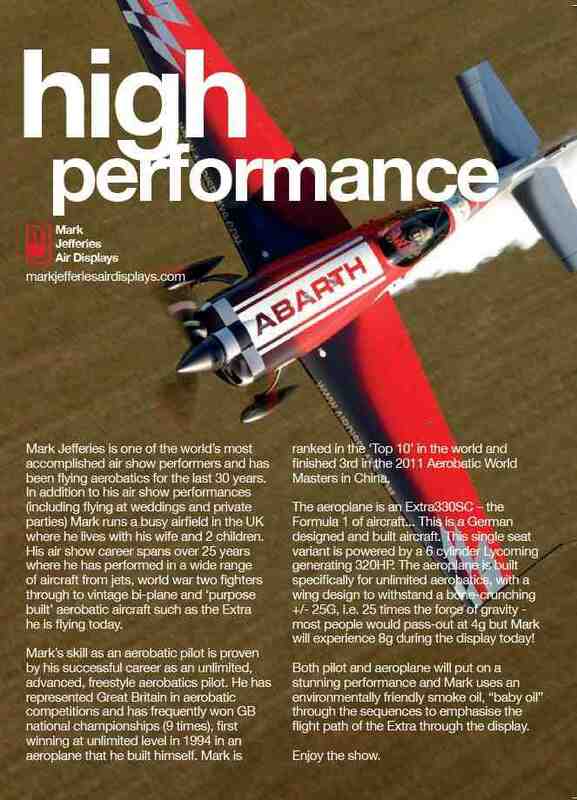 Bigger and better than ever this year the show, which is a free event, will be held on two days, Sunday 11th and Monday 12th August 2pm to 4pm and I will be performing in the Extra 330sc ‘presented by Abarth Cars UK’ – the ‘seaside’ airshows are great as we (the display pilots) get a great view on the run in to the performance and for aerobatics we are able to perform within our ‘box’ so the crowd can get a spectacular view of low level flying and we can ‘play to the crowd’ so everyone can get a good view of the sequences. This is the local air show for one of Abarth’s newest regional dealerships – Preston Motor Park – so we had to bring the show to the North West and Lancashire.